Historical (and contemporary) context went missing on Meet the Press. Imagine if the Sunday morning talk shows had existed in 1776. Surely, they would have welcomed the most widely read and provocative journalist of that historic year. An intimidating question, to be sure. Too intimidating, determined the founders of the American experiment. After Paine’s compatriots prevailed in their revolutionary endeavor, they wrote into the Bill of Rights a protection of the ability of a free press to speak truth to power, to call out and challenge the machinations of those in government. Unfortunately, this history is sometimes lost on contemporary Washington. So it was that when Glenn Greenwald appeared Sunday on NBC’s Meet the Press to discuss his reporting on leaks detailing National Security Agency programs that monitor phone calls and digital communications, he was asked whether he was the bad guy. Greenwald countered with a suggestion that Gregory had embraced a theory—advanced by the Department of Justice in its investigation of Fox correspondent James Rosen—that journalists who report on leaks might be considered co-conspirators with those who reveal classified information. By any reasonable measure, Greenwald is a journalist. While most of his work in the United States has been online, he is associated with Britain’s venerable Guardian newspaper. Yet, even if he had no such association, even if he was a freelance blogger who had not published widely hailed books on civil liberties, Greenwald would qualify for the protections afforded by the First Amendment. He is, after all, an American writer following stories about what the US government does in our name but without our informed consent. That’s a classic journalistic endeavor, as is protecting a source. Gregory is also a journalist. He can and should ask probing questions. He should stir things up, even if that upsets or provokes guests—including Greenwald. What was problematic was the approach, which seemed to go at the task backwards. Instead of providing context—by noting that lawmakers had been griping about Greenwald, or even by referencing the Department of Justice inquiry that targeted Rosen—Gregory simply popped the “aiding and abetting” question. 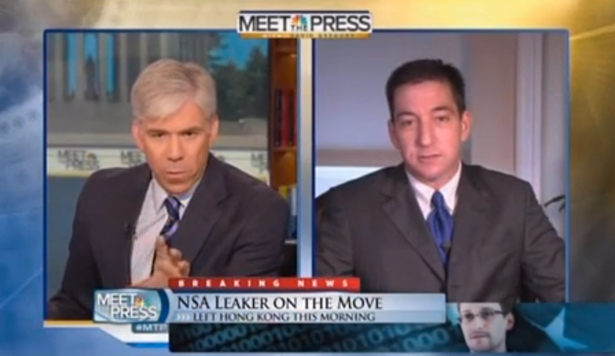 Only when Greenwald challenged him did the host respond with context. That’s troubling, because we are at a stage where contemporary and historical context are desperately needed. There is too little understanding today that the freedom of the press protection outlined in the First Amendment is not a privilege provided to reporters—it is a tool established by the founders so that citizens would have access to the information they need to be their own governors. Jefferson, Paine and their contemporaries often griped about the newspapers of their day. But they recognized, correctly, that the chains of ignorance had to be broken. They supported a free and freewheeling press as an underpinning of democracy in their day. As we should in ours. McClatchy uncovered more revelations about Obama’s “insider theat program”—but unlike The Guardian’s investigations, this news is going almost entirely unreported.